Blood may be on the mind because of Halloween, but we’re thinking more about Bloody Marys, those swell savory sippers equally suitable for brunching and afternoon game watching. Of course, what’s really spooky is a Bloody Mary that’s mundane. Our local bartenders are warding that fear off, with creative and sometimes audacious twists and takes on this classic, as shown by the six below. 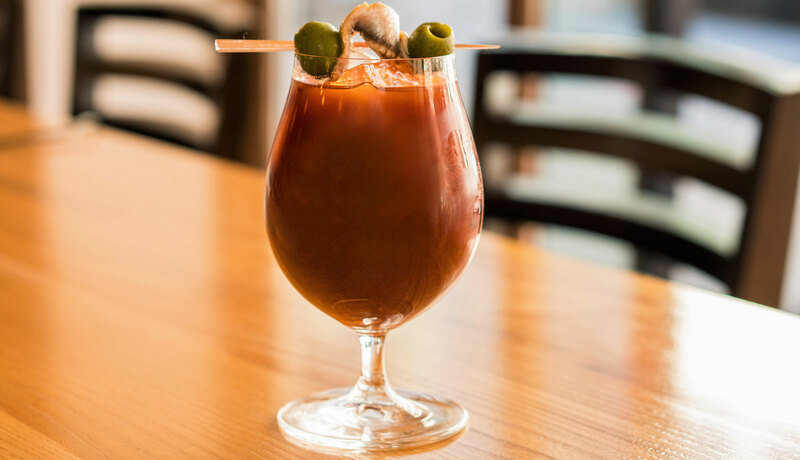 Known for delicious cocktails and food, which are often creatively paired, it shouldn’t be a surprise that this spot between downtown and Pioneer Square has an outstanding Bloody Mary. As with all in this list, they boast a house-made spice mix, but also use fresh lime and a tempting trio of spirits, all infused with tomatillo: vodka, tequila and Mezcal. They then garnish with a white anchovy and a duo of green olives. I believe it’d couple up well with anything on their newly unveiled brunch food menu, but the smoked pork shoulder hash is an ideal choice if you’re having decision-making stress. A friendly spot in lower Wallingford for fun drinks and food (the cake is not to be missed—even at breakfast or brunch), they do their Bloody Mary with a little extra kick thanks to fresh horseradish. They then add depth with Balsamic vinegar, and bring the flavor home via hot sauce, lemon, coriander, and fennel and celery seeds. The house-pickled carrots provide the garnish, but you’ll still want a bit more to eat. To play off that Balsamic, I think that eggs Florentine are the choice. This fresh spot is situated downtown on the ground floor of the recently unveiled Charter Hotel, (with sibling bar Fog Room on the hotel’s top; they have completely different cocktail menus, if you’re wondering). Their Bloody has the requisite house-spice mix (a little cayenne and cumin highlight), as well as yellow onion juice made in house. That’s right; they juice their own onions. Also, if not feeling vodka-ish, try the Red Snapper, a Bloody Mary cousin made with gin. Have either with the savory Shakshuka. At this Bothell pub and brewery (be sure to stop by the Wildwood Spirits Distillery on the floor below, too), you’ll find three different Bloodys to choose from, each using their house Mary mix and a different infused vodka: pink peppercorns, a fiery habanero or a pickle-spice infusion. Each has a slightly different garnish, depending on your mood. I feel the Pickled Mary is perhaps the most original, and it sticks to a straight salt rim, with nifty pickled veggies for the garnish. Balance out the salt with their sweet S’mores pancakes. Accompanying their weekend dim sum brunch (which has classic dim sum, Vietnamese and American choices), this Bloody pushes the envelope in creative and succulent ways with the addition of pho broth, as well as pineapple juice, caraway-y Kummel and various spices. A little Thai basil, lemon, olives and a spiced rim top things off. It’s going to match up favorably with most items on the menu, though in my opinion, you should double down on the pho or spicy noodle soup. While this local two-spot chain of sports-devotees is known perhaps more for large tables and TVs than cocktails, the Bloody Marys are made by hand and go well with any morning or early afternoon game. However, what set them apart is their ginormous gastronomical garnishes. You can get one topped with basically a whole platter of fried chicken, waffles and bacon (with a side of maple syrup), or one—as you might guess—garnished with buffalo wings. Each manages citrus, celery and olives, too.